What starts as a classic revenge story is slowly unveiled to be a progressive, semi-pacifist character study in Scott Frank's good-lookin' western. Many who watch Merritt Wever impatiently pull a gun on an old man who yells at her nephew one too many times — meaning, he yells at the kid once — will wish the series around her had an equally expeditious attitude. Wever’s character, Mary Agnes, is done finding bliss in the “child bearing and caregiving” ways of her fellow women. She dresses as she pleases, seeing no practical purpose for a corset. She dates who she wants to date — a woman — and generally does what she wants to do; mainly, outsmarting, outdrawing, and out-performing most men who dare dismiss her because she’s not ladylike enough. In short, she’s not one for delayed gratification, hiding behind custom, or wasting time in general, so when a loudmouthed man raises his voice to the wrong child at the wrong time, out comes her gun. And within seconds, Mary Agnes gets what she wants. “Godless” takes far longer to get from A to B, and while it may strain the patience of an ADD-riddled Netflix audience, it’s better for taking its time. Yes, Mary Agnes is a breath of fresh air every time her cut-to-the-chase persona moseys on screen, and yes, Wever — the Emmy-winning star of “Nurse Jackie” — is stupendous in the role. But so is the rest of the cast, including Michelle Dockery, Jack O’Connell, Scoot McNairy, and Emmy-winner Jeff Daniels, all of whom build their characters over longer periods of time. Both the quick and the dead-ly drawn-out elements come together perfectly to fit writer, director, and creator Scott Frank’s beautiful dream. After all, the “Out of Sight” scribe’s seven-part limited series isn’t meant to reinvent the western. Partnering with genre-twisting producer Steven Soderbergh, “Godless” embraces every facet of its ilk, from a core conflict between white and black hats to the illicit romances built by lengthy glances and implicit understandings. There are posses of gunfighters roaming through small towns, tense shootouts in dirty saloons, and sweeping vistas of such a scale you’ll wish you could see it in a cinema. It’s a western, and a damn fine one at that. Yet some expectations are worked to its advantage. 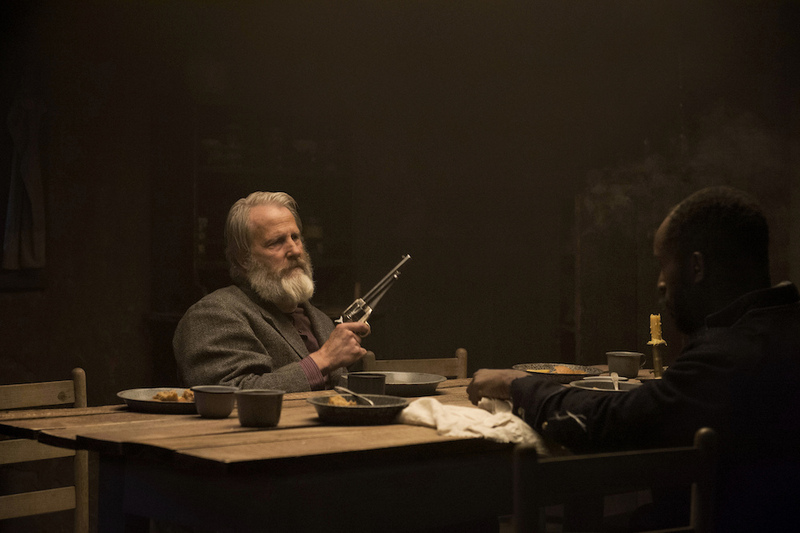 “Godless” quickly constructs a classic western premise in its debut episode, teasing a climactic conflict between two warring men before spending the next five episodes digging into everyone affected by their impending mano-a-mano gunfight. The white hat is Roy Goode (O’Connell), a mysterious cowboy who shows up in the middle of the night, injured from an earlier fight. His opponent? Frank Griffen (Daniels), a notorious outlaw leading a sizable gang throughout the west, and who’s now in hot pursuit of dear Roy. Roy takes refuge with Alice Fletcher (Dockery), a widow living with her son and mother-in-law just outside of a deserted New Mexico mining town. She’s been ostracized by the community for who she lives with and what she’s done, making it the perfect hideaway for Roy to recover. As he does, the two form a friendship that may lead to more if Roy could forget who’s chasing him, and what they might do if they find him with Alice. As the townsfolk slowly discover Roy’s identity, more of them get involved. There’s the local sheriff (McNairy) who’s slowly and inexplicably going blind, following the death of his wife. 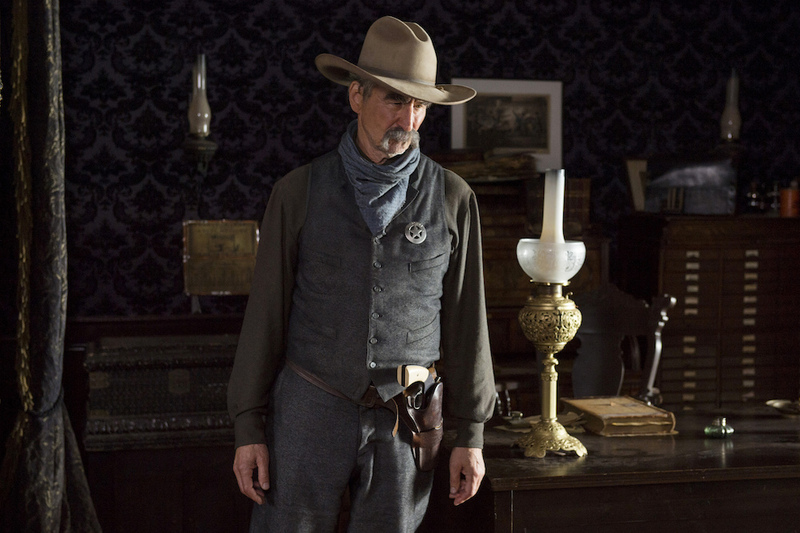 Not far removed is Sheriff McNue’s old friend, Marshall John Cook (Sam Waterston), who’s an old school lawman looking to protect his hindered brother-in-arms as well as the land he’s sworn to protect. And then, of course, there’s Mary Agnes. The sheriff’s sister is obviously no slouch herself, but she’s got her hands full with local business, including a suspicious new company looking to reopen the mine and take over the town around it. Equality may be impossible with so many stories, but no one’s development gets the short-shrift. The series makes time for its large ensemble accordingly. Most of the hour-long entries clock in closer to 70-75 minutes, and even at an abnormally lengthy run-time for TV, they never feel strained. Frank is as happy building backstory — doling out desaturated flashbacks after successfully teasing each eye-opening tale to the max — as he is watching Roy train a horse for double-digit minutes. Every scene has a passion to it, either in its nuanced presentation or committed performances. Between the two Emmy winners, fans should have plenty of people to carry them through the series’ slower pacing — which evokes the very same feel western devotees will adore. Frank’s series blends the best of the genre with unfamiliar narratives about gender, race, and faith. All the while, it builds a mystery around the past while driving to a pivotal showdown in the future. Every moment counts, making for an overall experience as to-the-point as Mary Agnes herself. Even when it appears to be taking some extra time for itself, “Godless” isn’t wasting a second. “Godless” premieres its seven-episode season Wednesday, November 22, exclusively on Netflix.